3K Computers is a company based in Boca Raton, Florida, about 20 miles north of where I live. This company has just released a low cost small factor PC: the 3K RazorBook 400. 3K RazorBook 400 - Mini-Notebook PC (UMPC) Ultra Mobile PC - Internet-Ready, Ultra Lightweight Notebook under 2 lbs with Powerful features. Entertain, Play, Relax and Surf on the go with shock-proof design. 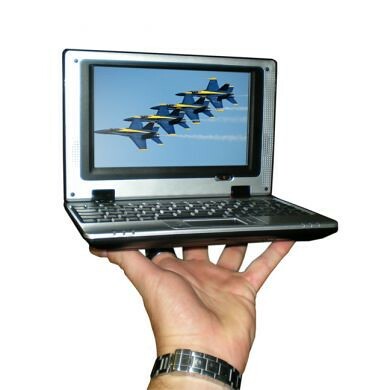 At 7" and weighing less than 2lbs, you can take the RazorBook 400 Mini-Notebook PC anywhere. Bumps and shocks are no longer issues. With a dependable solid-state disk, you get unparalleled shock-protection and reliability. Power-efficient design provides longer operating time when on the go. With a rapid start-up time that takes only 15secs to boot, the RazorBook 400 is always ready to get into action. No technical manual required with the specially designed, User-friendly and intuitive Full-Flash graphic interface. You're always connected with built-in WiFi 802.11 b/g that automatically detects and connects to the Internet at any hotspot. I invite you guys to check the specifications of this device. It uses an Ingenic 400MHz 32Bits Single Core Mobile Processor. I have to confess that I never have heard about this processor. But at treat clock speed it does not surprise me to see that's using Linux. The device uses a 4 Gb SSD and a 7" display. 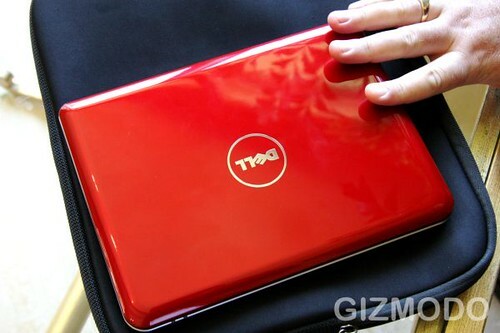 It's cute, it's red, it has a Dell logo, and for many, it's enough. The buzz machine has been reignited, after Michael Dell gave a prominent Gizmodo writer another peek at something small it's been cooking up in its laboratories. is Firefox 3 that good? I have been reading very good reports lately about Firefox 3. Most of them talking about how fast the new versions is it and how convenient for UMPC owners. But according to Paul's Supersite Blog Firefox crashes more often than what anyone would consider normal. I've been working on my Firefox 3 review lately and one thing I'm a little bit concerned about is the reliability of this product. Dell did not jump into Microsoft Origami party but almost two years later it's preparing a small factor PC. A device to fight back the popularity of the Asus Eee and the HP MiniNote. 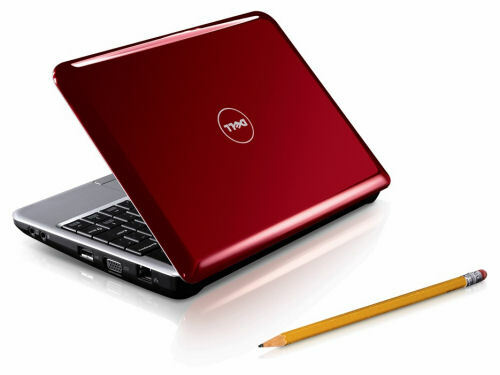 It's a small form factor notebook, just like the Asus Eee and the HP 2133. Windows 7 will offer Tablet PC support and even more, it will offer multi-touch support! You all probably knew Sydney Pollack, the famous director of Tootsie. But I'm sure that you probably did not know that he was a Tablet PC owner and fan. 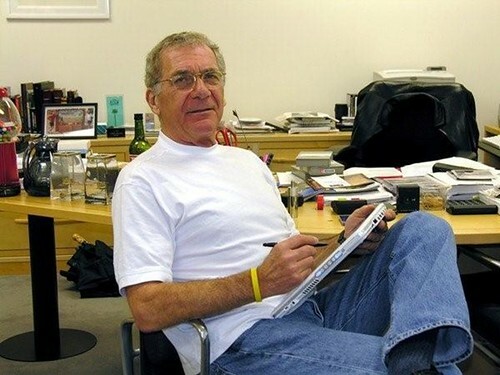 Sydney Pollack, the Academy Award-winning director of "Out of Africa" who achieved acclaim making popular, mainstream movies with A-list stars, including "The Way We Were" and "Tootsie," died yesterday. He was 73. Linda A. Epstein, Tablet PC enthusiast and editor of TabletPC.com had the pleasure of teaching Mr. Pollack to use a Tablet PC. This photograph shows him using a Sahara Slate PC from TabletKiosk, one of the two devices he owned. SSD is the future, no doubt about it, at least in mobile devices, this is why a news like this one is so good. Uh oh, Samsung's just announced their first 256GB SSD. Not that you needed to know anything more than that to trigger salivation, but the MLC-flash SATA II drive has speeds of 200MBps read and 160MBps sequential write. Not like we'll be able to afford it or anything, but they'll be available come September, with a 1.8-inch version due in Q4. As some of you already know a recently bought a Fujitsu P1610. And I'm not different than anyone of you, once I got it I went looking around for accessories. My first stop was Boxwave (Affiliated Link), the reason: a good screen protector. My relationship with screen protectors is a love-hate type. I hate it because it takes me long time to install one and I always get some dust under it. I love it because it keeps my screen as new. And this is a very important thing when you are selling your machine to buy your next one. Why Boxwave? Because I have been using their screen protectors for the last 4 years or more and their are one of the best I ever have used or tested. 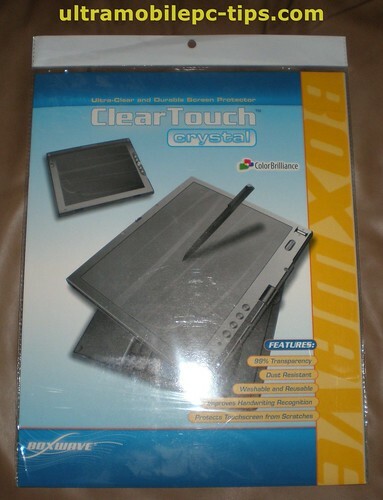 I have been using in my Q1 the Boxwave Antiglare but this time I went for the ClearTouch Crystal one. The P1610 has a very bright screen and I wanted to preserve it in this way and the crystal version has a 99% transparency preserving the color brilliance. The installation of this protector is a very easy process if you follow the instructions printed in the back of package. Another good point is that this protector is washable, this increase the life of this product. 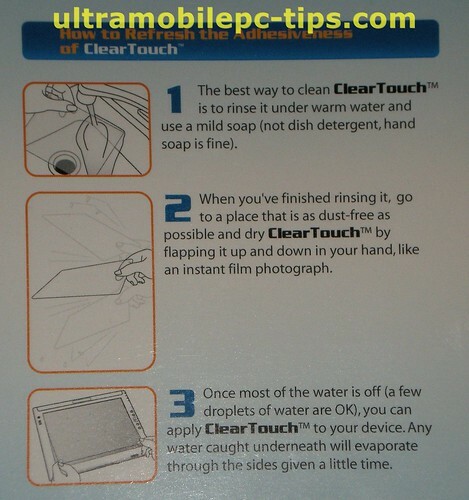 Screen Protectors are one of those accessories that are simply "Must Have". A Tablet PC is not cheap and anything you can do to protect it you will get it back in one way or another when you decide to sell it to buy your next gadget. Boxwave has many years of experience making protectors and my experience with them has always been good. 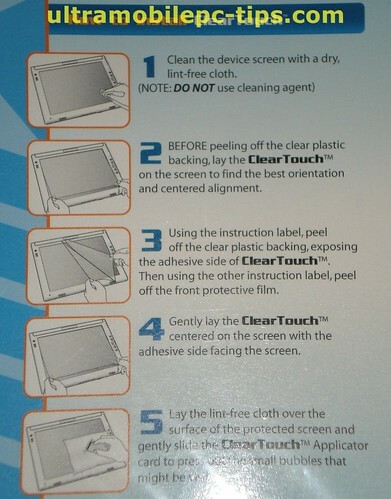 As a known freelancer I have the chance to test any of the protectors in the market, but the one I'm using right now protecting the screen of my P1610 while I'm writing this review is the Cleartouch Crystal from Boxwave. Here is one of the reasons why I love Vista, and that all I want in my Tablet PC or UMPC. This video says more than 1000 words. The handwriting recognition in Vista is the best I have seen. Period. And you can be sure that I have tested a few of them in my quest for the best one. You can imagine, this is a big news within the "Kindle Community"! Even when they say that it's not a news. This is not really news, it’s just note-worthy. 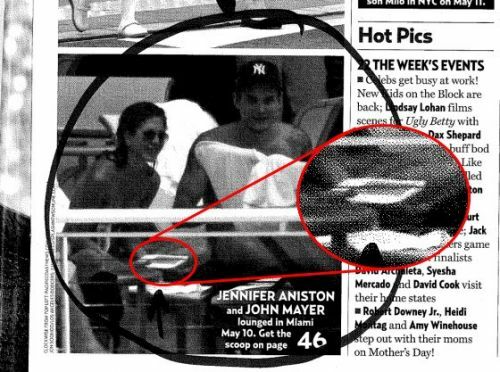 US Magazine has snapped Jennifer Aniston with her very own Kindle becoming the the first(?) celebrity to own a Kindle. Well, here it's, may be is not a really news, it's just note-worthy... I, Ctitanic, own a Kindle too! According to news published today at TechRadar, Samsung is thinking about to refresh the Q1 series in the first quarter of the next year. That's a good news! From all the UMPC in the market Samsung has been the most successful one in my opinion. James from JKonTheRun has published a very interesting article about two of the most important Operating System in the market: Vista and Mac OS X. Let me start by saying that the reason why we have this kind of article is because we have what we can in Vista. The situation with Vista is quite a different matter because it is the operating system that is running most of the computers I use. It is running four computers in my office right now and I depend on it to get work done. I don't blame Microsoft when I have hardware problems because they don't make hardware and it would be silly to do so. But I do blame them quite fairly when the OS doesn't do what I need it to do especially when I believe it is something that it should do properly My heavy usage of Vista-running PCs exposes me to a lot of situations when Vista drives me crazy. I'm not going to get into specifics here because that's not the purpose of this article but it is a hard, cold fact that every single day something happens on one of my PCs that makes me angry at Vista. That's a terrible thing to say about any product but it's absolutely true. At least once a day I end up saying "I hate Vista" because I'm trying to do something and Vista gets in my way to get it done. Three weeks ago I would not understand why James is complaining about Vista all the time. Three weeks ago I was lucky enough to be using Vista in a machine where the maker did a wonderful job developing all the drivers for that machine, I'm talking about my Samsung Q1. Beside the fact that Vista was not the faster OS for that machine, everything was super stable on it and I never had any problems at all. I only ran one time into a device - a webcam- where I could not make it work because of the drivers but I was able to returned it and buy a new one Vista compatible. But now things have changed. I bought a Fujitsu P1610 and even when Fujitsu has released a set of Vista compatible drivers the quality of them is not the best and Vista is fully unstable. But even in this situation, Vista is good enough to recover itself without giving me a BSOD. I have been battling for two weeks already tuning the drivers and looking for more updated version or substitutes for these drivers. And every time I have found one my P1610 works better and more stable. And this is one thing that I want to point. When you have your machine using Vista drivers that are not fully compatible with Vista, even if the OEM says that they are, that will affect your whole work in that machine. To give you one example, I was having problems with WiFi. Even at 10 feet from my AP the signal level was around 20%. I reinstalled the drivers and checked them to be sure that they are properly working and every thing was OK. I then searched the web for the most updated driver for that module, even if it was released by a different OEM and I found one, I installed it and all the problems disappeared. The same thing happened to my Audio driver. The ones I found in multiple Fujitsu sites were too old and some of them listed by Microsoft within the known incompatible drivers for Vista SP1. I ended installing the audio software from Fujitsu and manually installing the driver from HP. That combination is working more stable at least for now. But... How the normal consumer can survive all this? Why somebody should spend two weeks optimizing and looking for drivers to have a working machine and OS? Why the drivers in some OEM web sites, like Fujitsu are more than a year old and never have been updated? is not because they do not care about a year old machine any more and they are pushing buyers to get the latest of latest machine that they are selling? Why some of the OEM are not supporting any more products that they are still selling? They sell you a Web cam and when you upgrade your OS you find that this Webcam maker is saying that they will not create any drivers for the new OS, instead they are asking you to look into the latest version of the same piece of crap which definitely have drivers for the newest OS. And the same thing with some software. They tell you "the version that you are using is not compatible with Vista and we won't patch it to make it compatible so what you should do is to re pay us for the latest version". So, as you can see, my problem is not with Vista, it's not with Microsoft, at least partially, it's with the whole macro system created by OEM to make money using every Microsoft big upgrade. And I said partially because Microsoft seems to enjoy the creation of OS with the most of incompatibilities as they can. It seems to me like the developers are sitting in their offices using the most powerful machines in the market to create their new OS. Well, guess what, for Windows 7, my dear Microsoft, you should buy to your developing team a bunch of 486 and make them to create Windows 7 compatible with those machines. I'm sure that only then we are going to have a real fast and stable OS. Wibrain has released a version of it's B1 with Ubuntu installed. This version is already being sold at todoUMPC.com and they have released a video of the first boot of one of these units. The video is in Spanish but even if you do not understand this language you will find it interesting. It's the first Ubuntu fully running in a UMPC that I know about it! Everything is working! Superfetch, leave it on or turn it off? Windows SuperFetch enables programs and files to load much faster than they would on Windows XP–based PCs. When you're not actively using your computer, background tasks—including automatic backup programs and antivirus scans—run when they will least disturb you. These background tasks can take up system memory space that your programs had been using. On Windows XP–based PCs, this can slow progress to a crawl when you attempt to resume work. SuperFetch monitors which applications you use the most and preloads these into your system memory so they'll be ready when you need them. Windows Vista also runs background programs, like disk defragmenting and Windows Defender, at low priority so that they can do their job but your work always comes first. So, from this you can easily guess that this feature was designed to increase your system performance. Then, why if you look around the web you will find as many posts and articles recommending to turn it off as articles saying that it should be left on? The answer is Simple, because it does not work well in all the different hardware configurations available in the market. Fortune Fountain has released the Second Generation of DialKeys, a software that became popular after being released in almost all the UMPC devices AKA Origami devices. Im writing in to let you know that the latest version of DialKeys called 'DialKeys Gen2' has just been released. 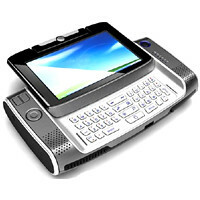 DialKeys is a on-screen virtual keyboard that was bundled with the Samsung Q1 when it was first released. All the on-screen virtual keyboards you might be already familiar with have undergone visual facelifts and now look better than they ever did. Apart from the visual enhancements, there are plenty of new virtual keyboard skins.. The new version also includes interesting new features such as the 'GPS Locater' and 'Picture Snapper' tools that are just a couple of the new features we have added to the latest version of DialKeys. We have also launched a web shop so users can purchase their copies of DialKeys Gen2 directly from us. There is not too much that I can say about this software because I never used in any of my UMPC. One of the reasons is because for example in the eo V7110 I had to type with my nails because the screen does not react to well to my fingertips. In my Q1 I never used because I did not like to see the fingerprints all over the screen of it. And the last reason is that I love the Vista TIP and the handwriting recognition. This is a test from Word 2007. REDMOND, Wash., and CAMBRIDGE, Mass. — May 15, 2008 — Today, Microsoft Corp. and One Laptop per Child (OLPC) announced an agreement that will make the Microsoft Windows operating system available on OLPC’s low-cost XO laptops for the world’s poorest children. Through this agreement, trials of the XO running Windows are planned to begin as soon as June in key emerging markets. Recognizing that the challenge of providing high-quality education for children in the developing world is too large to be solved by any single organization, Microsoft and OLPC are committed to working with governments and nongovernmental organizations to ensure the success of these pilot programs. The availability of Windows, in addition to Linux, on the XO laptop will allow customers to have an expanded choice of operating environments that best fit their requirements. The intention is to create a version of the XO laptop that provides the ability to host both Windows and Linux operating systems, giving users the ability to run either on the XO laptop. Customers and partners worldwide have requested Windows support for the XO laptop, because it opens the door for students and educators to access the benefits of existing Windows-based educational software and tools, as well as a broad ecosystem that provides extensive relevant and local educational content. Microsoft has spent more than a year working with a variety of partners to develop customized drivers that enable Windows to run on the XO laptop. Windows now supports the laptop’s e-book reading mode, standard Wi-Fi networking, camera, writing pad and custom keys, as well as the power-saving and other features of the XO hardware. The adaptation of standard Windows for the XO laptop means that hundreds of thousands of third-party applications and devices available for Windows will now be compatible with the XO laptop, extending the power and advantages of the full Windows ecosystem to XO laptop users. Additional technical details regarding Windows for the XO laptop and a video demonstration can be found at http://blogs.technet.com/jamesu. One Laptop per Child (OLPC at http://www.laptop.org) is a non-profit organization created by Nicholas Negroponte and others from the MIT Media Lab to design, manufacture and distribute laptop computers that are sufficiently inexpensive to provide every child in the world access to knowledge and modern forms of education. These XO laptops are rugged and so energy efficient that they can be powered by a child manually. The pricing goal is $100. I know that many of our readers are from Europe. So here is a good news for them. If you are thinking about buying a Amtek u560 (price in dollars). (Affiliated Link), that's the little guy in the picture in the right, todoUMPC online store is selling it in the next 24 hours for 100 Euros less than the normal price of 597 Euros, that's 497 Euros or 805.5 dollars (forget about the prices with taxes if you are not in Spain). I just spoke to the guys at the store and they ship the Amtek u560 to anywhere in the world. The operating system on these units is in English. Today I was writing at todoUMPC about how UMPC has became a wider concept than what Microsoft and Intel thought almost 2 years ago. And what a coincidence, my friend Warner from Gottabemobile was chewing something like that probably about the same time. The only problem is that Warner seems to have a different opinion about what is going on. ...Microsoft is either ceding the ground to other players, or is content to wait a few years before attempting a come back in this market with any real effect. Maybe after they have some sort of OS that can work with these devices. I won't call UMPC a marketing Fiasco. The whole Origami Concept serves to show OEMs that there was a market share for devices with displays between 5 and 7 inches. Now that OEMs found that market share they have came with multiple designs, some of them without touch screen. And that's the problem. 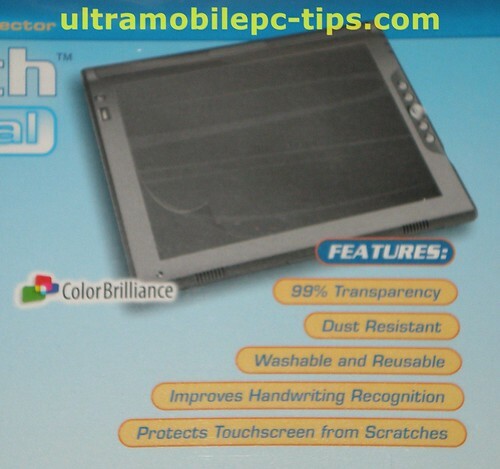 The original concept of UMPC from Microsoft and Intel said that UMPC included a touch screen. But here is the problem, Ultra Mobile PC. Where the heck is the touch screen or something pointing to a touch screen on this name? 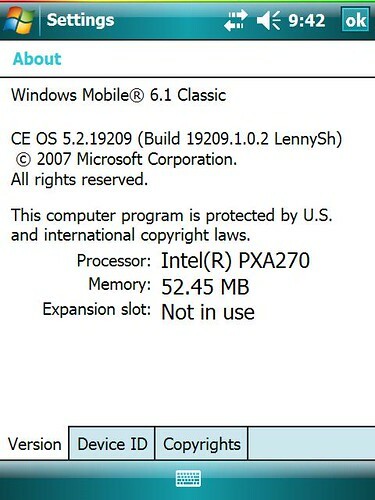 As far as I can understand an Asus Eee is an Ultra Mobile PC. It's one of the smaller PCs in the market which makes it automatically in Ultra Mobile. So basically, the UMPC have became or evolved into a big family of devices running a PC OS with screens between 5 to 7 inches. About a OS specially designed for them. I really don't want that. I don't like the idea. I have been a PDA owner for a long time and one of the reason why I'm now a proud UMPC owner is because I was tired to deal with special software designed for PDAs and the conversion of files to PDA format (either Palm or Windows CE). I don't think that we need another different software world for UMPC. What we need is an evolution of current processors. Something that VIA has understood a lot better than Intel. Instead of creating an OS that can work in UMPC what they have to come out is with a UMPC that can work with current OS. That will make the life of everybody a lot easier. So basically... What is a UMPC? A year ago I would say... a device with a touch screen between 5 to 7 inches running a PC Operating System. Today... I would leave it on "a device with a screen between 5 to 7 inches running a PC Operating System". From there you can have sub categories like mini Tablet PCs or mini Notebooks. In mini Tablets we have two sub categories: with active or passive digitizer. That's all. But I doubt that the normal buyer - not a geek like us - will go deeper in the UMPC category. They will buy a UMPC. So... after all my friend Chippy from UMPCPortal was right all this time trying to show me what the UMPC was all about. While some of the press still posting articles talking about a supposedly UMPC Fiasco we have companies like Fujitsu announcing a new UMPC coming soon according to news posted at Digitimes. 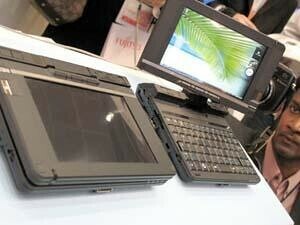 Fujitsu has showcased its second generation 5.6-inch UMPC U2010 with Intel's 45nm Atom processor. The UMPC will focus on the high-end market with a price of NT$40,000 (US$1295.34) and will be launched in Taiwan in July. The U2010 will have a 6-row keyboard (compared to five rows in previous generation models) and have built-in 3.5G and GPS modules. The device will weight 610g and features a rotatable screen. This one looks to me like a renovation of the old Fujitsu U800 or U1010. They still using the super slow Atom processor and on top of that Vista. Come on Fujitsu... Vista and Atom are bad partners! HP2133guide.com goes over upgrading the Hard Drive in the HP 2133 Mini-Note notebook. "Hey, I got a new toy... Let's see what is inside of it!" Chippy from UMPCPortal has found that the first Intel MID can be preordered already at Tegatech, Australia. Interested in mobile Internet devices? You know, the ones aimed at the consumer with consumer features and consumer pricing? Then read on… Tegatech, a well-respected UMPC retailer in Australia has recently signed a deal with Gigabyte for the distribution of it’s UMPCs and MIDs in Australia and New Zealand and has sent out an email to it’s media contacts announcing that my favorite MID, the M528 is on their books. A quick look at their website reveals that, yes, the M528 is listed, still looking very desirable, with a nice 8GB flash drive, the 3MP auto-focus cam, an 800×480 touch screen, 11Wh battery, built-in GPS, 3G radio and an 800Mhz Intel Atom processor. With a pocketable size, a pocketable weight and that slide out keyboard it’s a dream device for many. But here is the interesting thing, the price for this device is around 1280 dollars! Was not the Intel's MID concept talking about very cheap devices which only main task was Internet Connectivity? For that money you can buy a decent UMPC! A powerful laptop! 3 iPhones! And the other thing is that this price fiasco for some reason reminds me the 500 dollars price tag for UMPCs in the initial Microsoft/Intel marketing campaign. And I said Microsoft/Intel because during that marketing campaign Intel was part of it and a very active part of it and I wonder if the 500 dollars price tag really came from Intel and not from Microsoft. Raon Digital is refreshing the Everun product line adding a new model with SSD instead of existing HDD, all this according to news published at Aving USA. The EVERUN S32S Dic is SSD version of its previous model, adopting 32GB SSD instead of existing HDD. One remarkable feature of the EVERUN S32S Dic is 'SayDic', its electronic dictionary function supporting TTS(Text to Speech) and native speakers' pronunciation. The SSD will help the performance of this small UMPC a lot. The Everun is not one of the faster UMPC in the market and for sure you wont want to use it with Vista but with XP and a SSD it will be enough for a big portion of the market. Courtesy of todoUMPC I received today a few new pictures of the Noahpad, a new Subnotebook with a VIA processor that should hit the market this summer. It's really interesting the new keyboard concept. You can replace it with new language layout in just few minutes. Gail Levy, from TabletKiosk as published a very good article about how UMPC and Tablet PC can be used or are being used in the Hospitality Market nowadays. Having a mobile touch screen terminal to access this key information keeps restaurant managers out on the floor where the action takes place instead of in a back kitchen office. Bad boy.. Bad boy... Bad boy what you gonna do when they come for you? Well, in this case they are not going to do anything or pay anything because they are broke according to news published today at Beta News. The message is clear, the MPAA will keep going and going after anyone posting or allowing to post music or movies online. A Los Angeles federal judge has delivered a default judgement against the BitTorrent site finding it guilty of copyright infringement and forcing it to compensate studios. Steve AKA Chippy from UMPCPortal is writing about the Asus R2E. He just got it so these are just his first impressions. ...overall the R2E seems well build and has ample storage space even if the speed has not immediately impressed me but how would it improve my productivity, how would it perform as an Internet browser and an entertainment device? This is what I set out to find out in the following days. My opinion, the Asus R2E like the previous R2H is not one of the prettier or better build UMPC in the market but one thing is for sure, it's the one with most features that you can buy with a very small price compared to the rest of UMPC in the market. I know that many of you are waiting for this release: Windows XP SP3. Windows® XP Service Pack 3 (SP3) includes all previously released updates for the operating system. This update also includes a small number of new functionalities, which do not significantly change customers’ experience with the operating system. This white paper summarizes what is new in Windows XP SP3. Our friend Kevin at JKonTheRun has found a TIP new alternative. Atozed Software is confident that they have a Tablet PC Input Panel alternative that's more efficient than the native TIP found in Windows. After watching the demo video, they might be on to something, but I'll have to install "Inker" and give it a try. My general observation is that Inker might be preferred by some, but it looks a bit too cluttered for my use on a UMPC. I do have a full-sized Tablet PC though so I can give it a go on both. 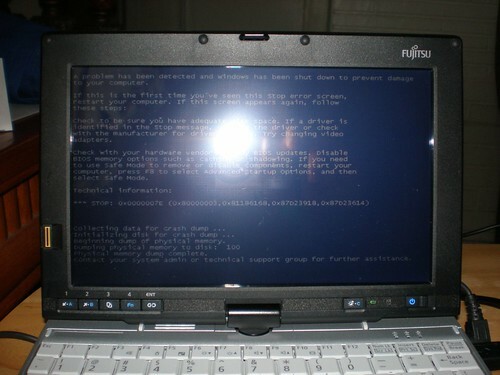 Unfortunately I'm very busy lately to test it because I'm moving everything to my just bought Fujitsu P1610. In another hand, I'm really happy with Vista TIP, for me is the best. That was fast! I sent it last Friday and I got it back today at 10 AM. Well, actually, it's at home waiting for me. According to tech support they had to change the motherboard on it. As soon as I'm back at home (around 5PM EST) I'll start again installing Vista Ultimate, my new best Diagnostic Tool! Many people can't live without a TV. But imagine a guy who wants to have an iPod, a GPS and a TV all connected at the same time (at least available to be used) in his car. What he is going to do? Well, according to our friend Steve from UMPCPortal.com, the answer is to get a Wibrain. I love the way that UMPCs integrate into cars so easily. With the docking station and it’s included GPS device, some navigation software and a good skin for your favorite media player, you have a very flexible system indeed. Although I love my Nokia N82 in the car for simple navigation and audio, having 60GB of videos, live TV, a full browser, the webcam and the great WiBrain screen makes you feel ready for any eventuality. Even work! One of these day’s I’m going to hire a minivan, load it up with UMPCs and do a city-city tour to see which UMPC is the ultimate in-car companion. I have a feeling that the WiBrain, with its excellent docking station, is going to be the one to beat! What is going on with FlipStart? Today Engadget has pointed to the fact that Flipstart own web store is redirecting buying to resellers because the have sold out all their inventory. Look, we're not saying that FlipStart is on the way out, but when your "store" page tells people that the stock of your device has been "sold out" and then directs them to a third-party retailer for accessories, things might not be looking so good. A few weeks ago this company cut down the price of these devices in about 50% and now this. To me the message is clear, we are not going to see any more FlipStart 1.0. But what about FlipStart v2.0? After of fighting for more than 16 consecutive hours trying to install Vista Ultimate on it without any luck, I finally got Vista Business Installed. To make the story short, I started around 6 PM installing Business, all needed patches, SP1, Office 2007, and moved all my settings from my Q1 to my P1610. The whole process ended about 2 AM. I went to bed to sleep about 4 hours. At 6 AM I was up trying to turn on the unit and guess what. The Power Button was going from the pretty blue into an ugly red and nothing more. Nothing in the screen, no beeps or LEDs blinking. I called Fujitsu Tech Support and they gave me a RMA number to send the unit back for repair. So what I learned from the whole process: Vista Ultimate is the best diagnostic tool that you can find in the market. It was right the whole time, there was something wrong with that unit. I called Fujitsu Tech support after trying for a Second time and getting the same error right in the same spot during the installation, and you guessed, the lady on the phone knew nothing about this issue. After talking with her for around 30 minutes and telling her that every single thing that she was recommending me to do I already have done it she gave me Microsoft free tech support number saying that it was a Microsoft issue because XP was running on my machine without any problem so it was not a hardware problem. Of course, I did not called Microsoft, Microsoft has everything well documented in their sites. I searched the error number 0x0000007E and I found this page. A "Stop: 0x0000007E" error message or a "Stop: 0x0000008E" error message typically means that a kernel mode component, such as a driver, encountered an error that could not be handled by the built-in Windows error handler. If I knew which one was the one with the problem. But the error is during the installation and when you restart the PC the only thing you get is a message saying that the installation was not completed and that you have to start over from the beginning. I tried also upgrading instead of a full clean install but the result is the same. The upgrade ends in a BSOD. Now, I'm trying again a clean install, this time a pre loaded some of the Fujitsu Driver using the Load Drivers from the installation and I'm using a different external DVD ROM and a I re-burned the Installation DVD that I downloaded from MS again in a new DVD from a different machine, just in case. So... in about... 2 hours I'll be back with the result. If anyone knows about this error or can help me in any way, please let me know. TIA. Update: Here I'm 8 hours later and 3 more installations that ended in BSOD. I disabled in the BIOS the BT, WiFi and Ethernet and tried it and that did not fix the problem either. I also tried an upgrade running the setup from the HDD, but that did not help. Contacted again the Fujitsu Tech Support and they are going to escalate my ticket. My next try is going to be install just Vista Business.